Space exploration and ground-based observations have provided outstanding evidence of the diversity and the complexity of the outer solar system. This work presents our current understanding of the nature and distribution of water and water-rich materials from the water snow line to the Kuiper Belt. This synthesis is timely, since a thorough exploration of at least one object in each region of the outer solar system has now been achieved. Next steps, starting with the Juno mission now in orbit around Jupiter, will be more focused on understanding the processes at work than on describing the general characteristics of each giant planet systems. This review is organized in three parts. First, the nature and the distribution of water and volatiles in giant and intermediary planets are described from their inner core to their outer envelopes. A special focus is given to Jupiter and Saturn, which are much better understood than the two ice giants (Uranus and Neptune) thanks to the Galileo and Cassini missions. Second, the icy moons will be discussed. Space missions and ground-based observations have revealed the variety of icy surfaces in the outer system. While Europa, Enceladus, and maybe Titan present past or even active tectonic and volcanic activities, many other moons have been dead worlds for more than 3 billion years. Ice compositions found at these bodies are also complex and it is now commonly admitted that icy surfaces are never composed of pure ices. 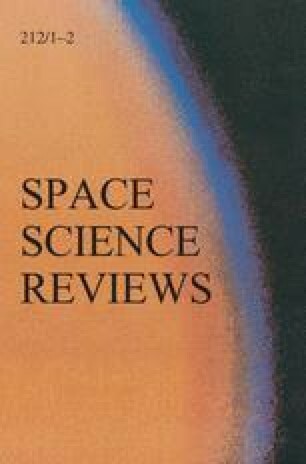 A detailed review of the distribution of non-ice materials on the surfaces and in the tenuous atmospheres of the moons is proposed, followed by a more focused discussion on the nature and the characteristics of the liquid layers trapped below the cold icy crusts that have been suggested in the icy Galilean moons, and in Enceladus, Dione, and Titan at Saturn. Finally, the recent observations collected by Dawn at Ceres and New Horizons at Pluto, as well as the state of knowledge of other transneptunian objects, are summarized, and complete this overview of the nature and distribution of ice-rich material in the outer solar system.